The tow dolly can be towed from 11 different hook-on points around the Elite, Classic or Premier camera car offering the director a variety of shots from which to choose. 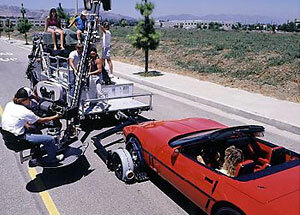 The tow dolly suspends the front wheels of the picture vehicle just 1" above the ground. The picture car is secured to the dolly with nylon straps around the front wheels, preventing any damage to the towed vehicle. Designed to safely carry motorcycles of varying tire widths, this tow dolly gives authenticity to your traveling shots. Just like the regular tow dolly, it can be attached to the camera car at any of 11 hook-on points. The motorcycle tow dolly measures 5'8"W x 5'"8L and has a ground clearance of 1".